The Fog Tunnel is a stainless steel enclosure that may be retrofitted on any existing conveyor system or custom manufactured. 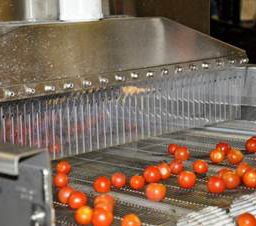 The contained structure prevents worker exposure.The Fog Tunnel is a stainless steel enclosure that may be retrofitted on any existing conveyor system or custom manufactured. The contained structure prevents worker exposure. All materials used in the fog tunnel are food grade. All materials are UL & NSF approved, and BPA free. All components are also RoHS compliant. Both air & water are filtered prior to entering the system and oxygenated at output, thus also aiding in the cleanliness of the system.